Launched in 2005, Rachel Roy's eponymous line of clothing is created 'to help women feel smart, confident and individual'. The label has garnered great critical acclaim, known for its striking silhouettes, sophisticated color palette and inventive pairings which transition seamlessly from day to evening. Bold contrast colors and flattering shapes characterize Rachel Roy knitwear. In luxurious fine knits of impeccable quality, these versatile designs will add timeless style to your closet. 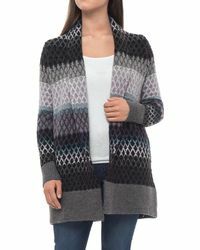 Showing 28 results for "Women's Rachel Roy Knitwear"